Supporters of Thailand’s former prime minister, Yingluck Shinawatra, outside the Supreme Court after she failed to show up for a verdict, Bangkok, Thailand, Aug. 25, 2017 (AP photo by Wason Wanichakorn). 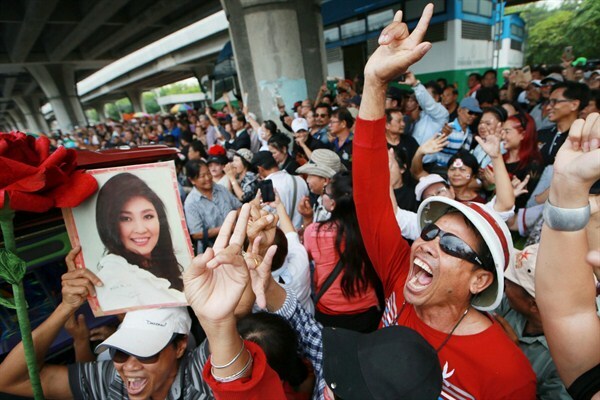 Thais waited anxiously throughout the summer for the conclusion of the trial of former Prime Minister Yingluck Shinawatra, who was removed by a military coup in May 2014. The charges Yingluck faced—mismanaging a rice subsidy scheme that wound up losing some $8 billion—were somewhat unusual, since she was not personally accused of corruption in the program. In some ways, she was being charged with making bad decisions in government.